It opens with a note that’s equivalent to a ray of bright light hitting the eyes for the first time. The sounds of a music box follow. A melody floats in, an idea in the mind of a newborn. It flows. It sings. It’s simple. It’s–haunting. Lake Forest High School hosts a festival every year celebrating the best wind, brass, and percussion players from 10 high schools across the North Shore. 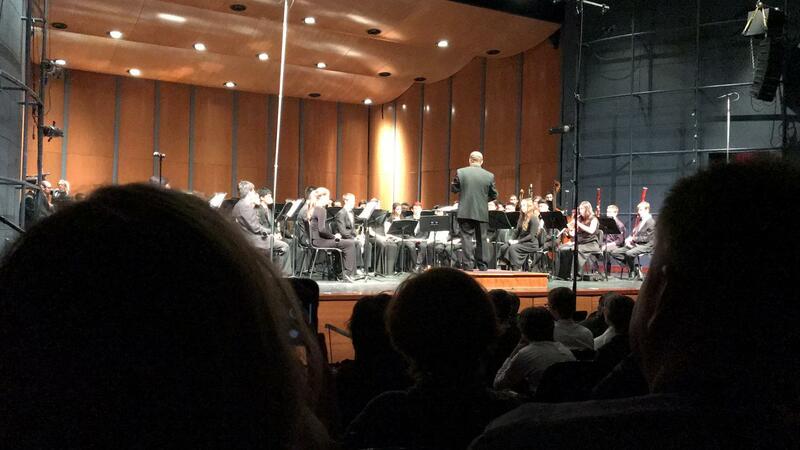 With guest conductors directing a band of freshmen and sophomores and a band of juniors and seniors, the groups have less than 24 hours to produce something larger than themselves. In this 20th anniversary season, the something produced was quite something. It mourns with a yearning melody. It soars with some kind of hope amid dark undertones. It’s some kind of wonderfully complicated melody that is simple to the ear, but full to the body. Everyone has “their piece.” It might include a solo. It could be fast. Or slow. Sometimes it’s just ingenious writing. Other times it’s just something new that catches your attention. This one encompassed a lot of these. It’s somehow mesmerizing and enchanting, and dark and deep and sad. And we were going to play it. There’s a melody on top of another. It passes from instrument to instrument, color to color. The trumpets sound like cries. It grows like a flower blooming, and then falls back like a frost has snapped. It leaves us to two voices singing back and forth, trying to grasp something that may or may not be there. The technicality of putting together a piece requires the concept of shaping a melody, notes of quieter here, breathe here, more trumpet here, more harp there. You don’t talk, no one does, except for the conductor, and you use your pencil to mark things in the music, you take a swig of water, you fiddle with your keys, you listen for directions, you play when you’re asked. It’s like being in a trance, a time warp, where there’s no sense of how much time has passed and the minutes are sucked up into the music. We spent probably a couple hours on this piece alone. The end swells to a point where the world is everything breathtakingly good, every beautiful thing is exceptionally beautiful. Then the bottom drops out, and you can start to tell that it’s dying, whatever that beautiful thing is. It sings a final duet, and then falls. You can feel it fall too, besides just hear it. You can’t move when it’s finished. Can you breathe? We came close to not performing this hauntingly beautiful work. Our director, Dr. James Hile, was worried it might be too much for us to handle, too much of a dark and emotional burden to perform. Composer James Barnes wrote it for his daughter who died at birth. It’s an audible painting of what her life might have looked like. Hile himself struggled to contain his emotion when talking about the piece, even in performance in front of hundreds of people. He performed it after a close friend of his passed away. It was clear that it meant something profound to him. Musicians have the special opportunity during their careers to attach themselves emotionally to a piece of music. Sometimes it’s through joy, other times because of a death of someone, or because of a past experience brought back to life in a different form. A lot came back to me during the performance of this piece. Mrs. Johnson’s life. My personal emotional struggles. My wishes for what my life would look like, even though they aren’t quite possible. The pureness of innocence and childhood and life itself. This piece has become something profound to me. It’s something I can’t quite describe. “For Natalie,” performed by the 11-12 North Shore Honor Band on Jan. 12 at Lake Forest High School.